There is always that joke that exercise bike become glorified clothes racks in some homes. Users can’t put them away, so they become part of the furniture, and perhaps aren’t used as often as they could be for the right purposes. Portable, storable, compact exercise bikes can make all the difference here. It helps to have a fitness equipment that fits the space, without taking it over. 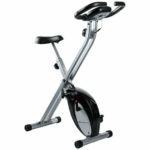 There are many top rated folding exercise bikes around with great features and workout options. The folding x-frame is an important starting point, but there are other elements to look for too. 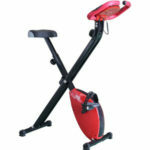 Important features to look out for with the best folding exercise bikes. The frame is the best starting point because it need the ease of movement, compact shape and portability to suit users. It also needs to offer safety and comfort, but this comes from other elements like the stabilisers, ergonomic shapes, saddle and pedal design. From there, buyers need to look at the workout offered. Is this folding model still able to provide a good workout? What is the main purpose and highest intensity level? Check the resistance levels, the quality of the console and any other extra features on offer. 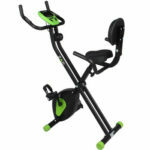 Some top rated fold up exercise bikes that tick many, if not all of these boxes. This first fold away exercise bike model gives a really good impression of what to expect with these folding x frame bikes. It is a sleek, unisex model, and this is clear in the simplicity of the look and the adjustments of the frame. The seat adjusts from 78 to 86cm and folds up to 131 x 43.5 x 45 cm for stage in a cupboard or against the wall. 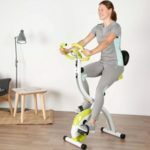 This style means that this is the sort of indoor bike that anyone can get onboard and use for a personal, effective workout. There is a console with data on time, speed, distance and pulse – the latter coming via the sensors in the handlebars. It is also worth noting that this is a basic package with room for add ons. There are Ultrasport accessories to buy with the bike at an extra cost. These include the media shelf, saddle cover and a mat for the floor. 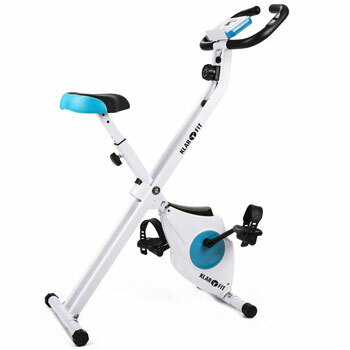 The frame here has a lower central axis to the x-frame than is seen in some other stationary bikes. This is important because of the ease of access for older or less able users. This all suggests there is a little more focus on safety and comfort than with the workout. There are height adjustments to the seat, along with padding on the saddle and ergonomics in the frame for a better riding position. This is also sturdy with the wider footprint. Still, there is a good workout to gain here too. This home recovery cardio trainer is a great rehabbing tool and fitness aid for those that need a little help after illness or injury. Users can work at their own pace and track their progress on the LCD computer. The use of the 2.5kg flywheel with 8 resistance levels is just right for this approach. Like many of these slim, x-frame bikes, this model initially looks as though it might not be the most stable model. There is always that risk of these machines tipping over with a more intense session. This shouldn’t be the case here with the strength of the frame and the shape of the front and rear curved stabilisers. There is also a 4-way adjustment system on the seat for increased comfort and a better riding position. Non-slip pedals with safety straps finish the bike’s safety features off nicely. From there it is all about the workout. 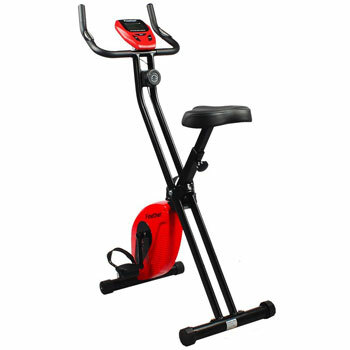 User can work at their own speed for personal goals with the simple manual tension dial to increase the resistance. The 2.5kg flywheel for a good transition and smooth motion here. Overall, this is a good, reliable system for a wide range of users. The whole point of this folding frame is ease of storage and transportation. The bike has to fold down into a compact shape so users can put it away in the cupboard, or other storage area with ease. The problem is that some designers don’t go far enough here. They add that axis to minimise the shape, but they don’t make it that portable. This model is different the folding frame has a light weight of 16.5kg and dimensions of 43 x 46 x 131cm when it stores away. It also has transport wheels to make the process easier. The frame really is the focus here as it offers little more than a basic workout for regular, daily exercise. It does so via the 2.6 kg flywheel, 8 levels of magnetic resistance and data on an LCD computer for all the basics. Users won’t see massive transformations in shape, but they can transform their daily habits. 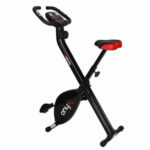 Going back to that idea that these machines aren’t tough, there are some top rated folding exercise bikes that do offer some weight and a tough frame. 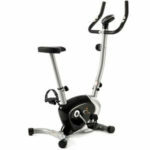 This Finether gym bike is classed as heavy duty model with the strong frame, 220lb weight capacity and 3.3lb flywheel. Note that the company use pounds not kilos to make it sound tougher than it is. Yet, it will still allow for a smooth motion. The strong frame is also safe and adjustable. The seat post moves between 29.9 to 33.5 inches and there are supportive stabilisers. There is also a good use of materials with the foam on the handles and rubber on the pedals. This all means that users can work through the 8 different resistance levels with ease. They just have to turn the knob and work out at their leisure. 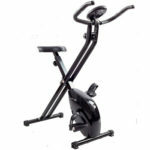 By now you will see that there are lots of similarities between these top fold up exercise bikes. They share many of the same features – from the number of resistance levels and flywheel size, to the shapes and console functions. This pattern of traits is because there is a formula that works in these situations. There is an optimal amount of activity on a folding frame, and designers work to those standards. There isn’t going to be a HIIT-ready machine with a slender, folding X-frame. This Viavito Onyx bike ticks all the right boxes in terms of what to expect from this sort of machine. There is nothing that stands out, but there is some peace of mind here that buyers get what they are looking for in an accessible, entry-level machines. There are 8 resistance levels to choose from, a 2.6lb flywheel and a 100kg user weight allowance. It is strong and functional but not over the top. There is also the simple LCD console and hand pulse sensors. While the Viavito model has nothing that makes it stand out from the crowd, this ZAAP x-bike does. The selling point here is the recumbent approach. This means a wider seat and more comfortable, reclined riding position. This will suit some larger and less able users that struggle with typical saddles. This idea of a bike for the larger user continues with the user weight allowance of 120kg, this extra allowance comes from the heavy-duty steel frame. It is all about offering support to a demographic that probably assumed that folding exercise bikes weren’t for them. Again there are 8 levels of magnetic resistance, non slip pedals with safety straps, and a console for data. That console may be a little more difficult to read in a reclined position, but it still offers important information on goal progression. 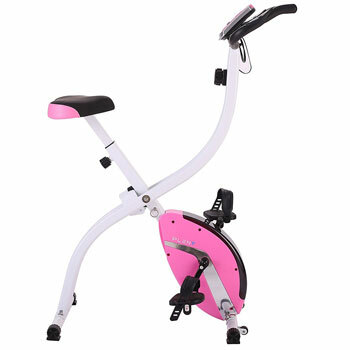 It is important to ignore the curves and pink and white design on this Pleny folding exercise bike for a moment. This cute look doesn’t really help to sell this machine as a tough, interesting option. Yet, there is something to the mechanisms that stands out. There is a 16 level tension control knob on this indoor fitness bike rather than an 8 level one. This doesn’t mean that there are higher intensity levels for greater tests of fitness. It just means that there are greater increments to choose from. For example the difference between a 4 and a 5 on another bike could seem too drastic for newcomers. Here there is that gradual progression to ease them in. This, along with the helpful computer console and smooth motion, make this highly appealing to new users. This approach, and the shape of the bike machine, give users confidence to try things out and achieve more. 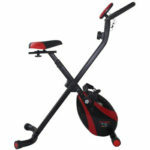 This fold away exercise bike model, on the other hand, boasts a 3kg flywheel, rather than a 3lb one. 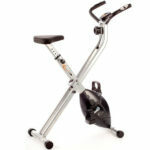 This again shows the importance of reading the fine print when comparing top rated folding exercise bikes. This means that this is the toughest, largest flywheel in this list. The result is that this only improves the performance and motion for users. The brand also claims that there is great diversity between the resistance levels. There are only 8 of them, but they are said to go from flat terrain to steep mountain. Opinions in these levels will vary depending on the user’s experience levels. This is a tough, sturdy bike with a good frame and rubber pads to prevent damage to the floor. There is also a 4-step adjustable saddle, non-slip pedals and a console with important data. Overall, it seems that the designers have considered the needs of users from all angles. 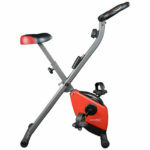 This final model in this list of top rated folding exercise bikes has its own key selling point. This time the designers realised that the data offered on a workout is as important as the resistance and method of obtaining it. Many of the consoles in this guide are quite basic. 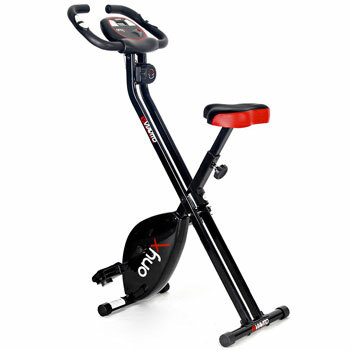 This V-fit MXC1 magnetic cycle is a little different because it has a 7-function LCD monitor for general stats like distance, speed and time, but also some more interesting reading like the hand pulse readings, odometer and theoretical calorie burn. Otherwise, the workout and build of the machine is pretty similar. There is a 100kg user weight allowance to the frame, which also has a simple pin system to fold it up and a height adjustable saddle. The specification also boasts self-presenting pedals, a friction free 1.2kg flywheel and 8 resistance levels. This indoor exercise bike also has a tough 3kg flywheel and 100kg user weight allowance due to its tough frame. This model looks like a more high-end option somehow ,with the look of the bike, the shapes and the use of black (rather than pink or other bright colours). The Pu moulded saddle looks the part, but is not everyone’s cup of tea. The specification isn’t that much better or worse than other models here, but first impressions can be crucial, so that design in important. That specification includes hand grip pulse sensors, 8 levels of magnetic resistance and self levelling pedals with straps. It is 17.6kg in weight, so a little heavier that some of the lightweight models here, but still folds away neatly for storage. Overall, users can get a good work from this Roger Black Gold Folding Exercise Bike and it should meet the expectations that come with the name. 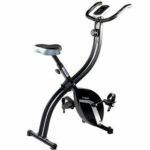 Choosing the best of these top rated folding exercise bikes for your home. That helpful folding x-frame is a common feature among apartment-friendly designs. That is why is pays to look at other criteria when choosing these bikes. They all fold down into storable shapes, but they differ in the shape of the frame, ease of access and security. Less able users should look at the ease of setting up the bike, a lower axis and simple settings. More experienced uses can focus on the quality of the flywheel, the data displayed and other features that will enhance the workout. None of these machines are intense, gym-ready models with lots of features. If you want that, you will have to sacrifice the folding element. In fact, there are models here that are the gentler, folding cousins of tougher models in a bigger range. But, that doesn’t mean that you cant find a functional, well-made and even attractive model that suits your needs. Compare your options and pick one that ticks the right boxes.